Yesterday MassivelyOP dropped the bombshell that we'd all been dreading. The next chapter of GW2's Living Story might be slightly delayed! Oh, Noes! How will we cope? Is there counselling available? I was unable to stop myself from commenting on the thread (which has mushroomed in just a little less than twenty-four hours to an astonishing six comments) that I'd personally be happy to see ANet drop the Living Story altogether. I would, too. I've been playing GW2 for six years, give or take. I have three accounts and I play each of them, every day. I long ago stopped caring whether we get any new content. I'm quite happy with the content we've got. I do my dailies, I run around in WvW and if I'm in the mood I pick away at odds and ends I haven't done yet - which is pretty much everything. Can I help you? Spit it out, man, time is money! I have thousands and thousands of hours played. I have nearly twenty characters. I've never done Map Completion or finished the Personal Story on any of them. I've never crafted (or bought) a Legendary Weapon. There are dozens - maybe hundreds - of Achievements I don't have and Collections I haven't finished. Or, for that matter, started. As I've mentioned before, I strongly prefer the uncelebrated efforts of the team that produces the Side Stories and Current Events to the heavily-publicized, usually disappointing, Living Story chapters. Their work is on a scale I can understand and appreciate and the results seem much better integrated, much less disruptive, more "of the world". I'm not sure who was responsible for Sitting In Chairs. It might have been the Current Events people or maybe it was just part of the regular housekeeping all MMOs undergo. The ability to park your posterior reached Tyria a month or two back. I did register it at the time. I knew there was a collection or an achievement or something. It wasn't until yesterday that I finally got around to looking at it properly. Whoever hung that painting needs to find another line of work. That was when I found out the reward was a title - Armchair Commander. Titles are one of the few things that can motivate me to do something I otherwise wouldn't in an MMO. I really wanted that title. Otherwise I don't imagine I'd have had the patience to traipse around forty-two locations, looking at upholstery. I only had to mention the title to Mrs Bhagpuss, who also hadn't paid it any attention until then, and she was off looking for chairs too. It was going to be a race but somehow she managed to get motion-sickness from all the sudden sitting down and standing up and had to retire to bed, so I finished mine first. (She did later recover to get all forty-two safely by taking it slow and steady. Who knew sitting could be so dangerous?). As I criss-crossed Tyria in search of seats as yet unsat in, following Dulfy's detailed but not entitrely necessary guide (most of the seats are actually in clusters next to each other), I marvelled once more at how perfectly suited GW2 is to offer full-function player housing and how peculiar it is that instead the developers choose to give us nothing but extremely impersonal Personal Instances. I'm still betting on Housing as a major feature for XPack #3. Possibly underwater. Locked room mystery solved: they got in through the skylight. Finding all forty-two chairs took a couple of hours and very enjoyable hours they were. It would have been a lot less if it hadn't been for that one chair in Rata Sum that needs either a glider or a mount to reach. I had to get a Mesmer out for that one to port in one of Mrs Bhagpuss's characters. It did make me wonder why they picked such an obscure location but maybe it's a unique design. Or someone just thought it would be funny. Like the Othmir holiday I praised yesterday, this is exactly the kind of content I want. Some things to find and a nice present for finding them. GW2 has a fair bit of that kind thing but it's often well-hidden. Whenever I make the effort and do one of the little scavenger hunts, collections or round-robin visits, I feel surprisingly satisfied - pleased with myself, even. I can't say I ever feel like that at the end of a Living Story episode - more like exhausted, enervated or annoyed. I can say with confidence that I've had more pleasure doing the Krait daily that came with the underwater revamp than I got from any of the recent LS material. I kill ten Krait on each account every day, take my Rusted Key and go looking for a Sunken Chest that works (there's some weird timer on the spawn now). It's fun. I've fallen out of the habit of doing the Joko Invasions, now reduced to Remnants, but I really enjoyed those for a good while, just like I enjoyed the Bandits before them, and the Ley Energy and all that stuff before that. And it's all still there, too. I hear people every day, calling out Bandit Champions and Legendaries in map chat or trying to co-ordinate a response when The Awakened portal in. This is what an MMORPG needs, at least it does to my way of thinking. This and more of this and more of this again. This is the true "living story". The quarterly content drop is just a distraction. No need to fret about those "quality standards", Mike. You go ahead and take all the time you need. We're fine as we are. I think I'll go for a bit of a sit down. In my opinion, EQ2 may not have the most MMO holidays but it definitely has the best. 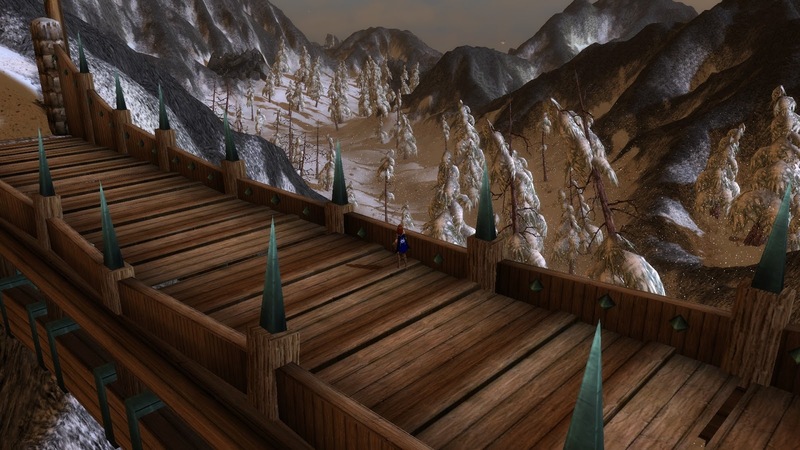 The major events - Frostfell, Nights of the Dead, Tinkerfest, Brewday and the rest - come packed with enough quests and collections, races and achievements to keep regular players occupied for days, if not weeks. As well as the big ticket events there are the monthly City Festivals and the Moonlight Enchantments that follow the lunar calendar. 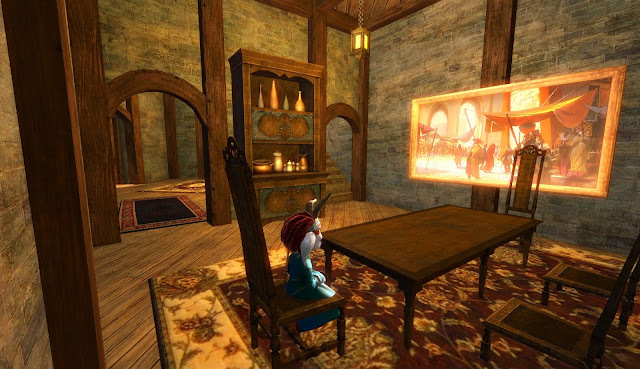 There's almost always something to do in Norrath so you might think there'd be no need to add any more annual events. The EQ2 team would beg to differ. I only happened to notice the addition of the upcoming Oceansfull festival when I spotted a single-line entry on EQ2 Traders a few days ago. If it hadn't been for the accompanying picture I might have missed it altogether. The news squib links to a full description of the brand new holiday event, which is currently running on the Test server before it goes Live on June 8, when it runs for ten days until June 18. "For generations, the othmir have been giving thanks to Prexus at this time of year for all he provides, above and beneath the waves. 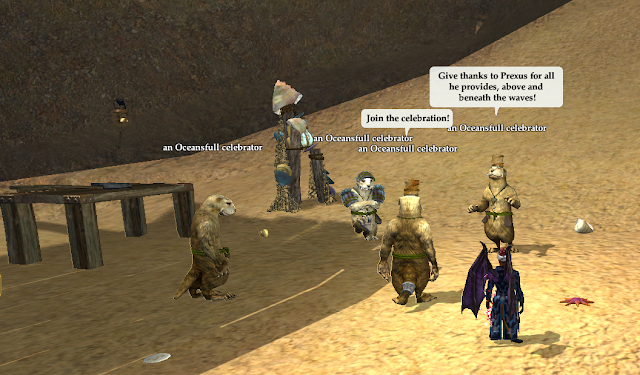 You are welcome to join any you may find celebrating along the oceans' edge, across Norrath. They say if you search the waters nearby their celebration locations, you're bound to find evidence of Prexus' generosity." The new event seems to have been timed to fill that uncomfortable gap between the final flurry of festivals late Spring and the arrival of Tinkerfest in mid-summer. It's also been timed to make its first appearance almost exactly as I'm away on holiday. I will be back for the last few days, but rather than wait I decided to wake up a few of my old Test server characters and take a look right now. 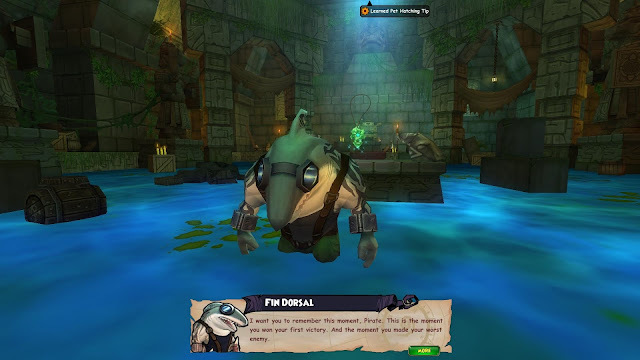 Niami Denmother describes Oceansfull as "a mellow little festival", in keeping with the well-established gentle, whimsical nature of the ottter-like Othmir race. There may be people who don't like Othmir but if so I don't think I'd want to spend much time hanging out with them. I've had an abiding affection for the fish-eating, hat-wearing seafolk since they first appeared in EverQuest's Scars of Velious expansion all the way back in the year 2000. I spent many happy hours helping the Othmir protect the beaches in Cobalt Scar, glaring with disapproval at the greedy druids and wizards who chose to slaughter my furry friends for the loot instead. The Othmir have played a significant, if minor role in EQ lore ever since, cropping up in various contexts in both games. Several of my EQ2 characters have taken on Othmir tradeskill apprentices over the years. I still visit them now and again to give them some more training and copy down the new recipes they discover. Playing on Test used to require two separate installations of the game but these days you can just toggle from Live to Beta to Test from the Launcher. It works perfectly. I did that, then looked at my large roster of Test characters. Having played there for five years or so I have a wide range to choose from. I have several level 90s, the cap when I moved to the Freeport server with the coming of F2P, and plenty more in most deciles down to level 20 or so. I picked my Level 90 Ratonga Bruiser, who was the character I was playing most often when I was a Test regular, logged him in and took him to the nearest qualifying beach, which happened to be at the Commonlands Dock. I had time to take a single screenshot when the heavens opened and a massive thunderstorm began. EQ2 has some very dramatic weather effects. Freeport goes almost black when rain sets in and even in the Commonlands heavy rain reduces visibility to a few yards. It also leeches the color out of everything, rendering screenshots muddy and miserable. Not ideal for a blog post about a cheerful little summer festival. Fortunately, travel in EQ2's version of Norrath is quick and easy, especially if you have an All Access Member's right to use the Fast version for free. 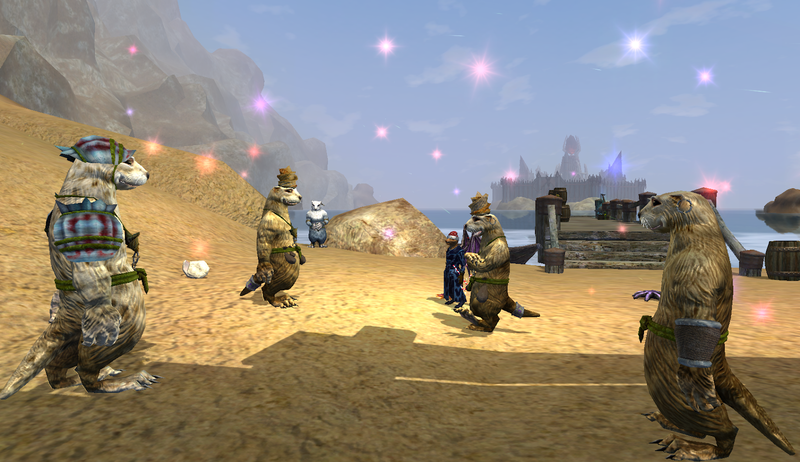 In a matter of moments I was flying a griffin across Antonica to the Tower of the Oracles, where the handy list of locations at EQ2 Traders told me I'd find Othmir celebrants letting off fireworks and dancing. I found the otters alright. It wasn't raining either so I was able to snap a few shots as they capered. There was a problem, though. The event consists almost entirely of opening giant clams to collect gifts. Clams live underwater. 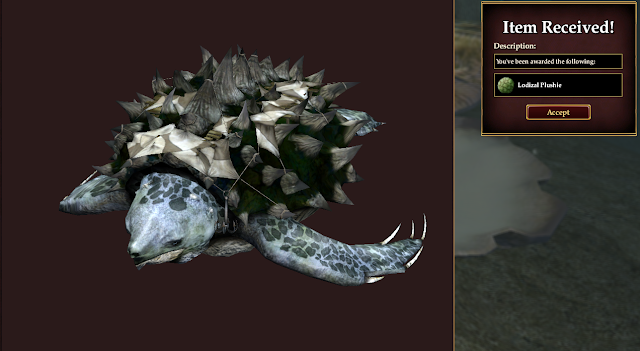 In EQ2, unlike GW2, you need special apparatus or magical assistance to breathe underwater. You'd have thought that a level 90, who'd retired at the peak of a highly active adventuring career, would have some piece of equipment that would provide a basic function like Enduring Breath. Or at least a few Totems of the Otter, the crafted consumable that cast that spell. Yes, well... you'd be mistaken. Five minutes later I was back on the Griffin, heading across Antonica with my Level 60 Inquisitor. Inquisitors can cast spells that let themselves and their groups breathe underwater. So I did that. Then I swam around in the murky waters off the Antonical headland, opening clam after clam. It's a gloriously soothing experience. The clams are huge and easy to spot from a distance. There are plenty of them. They have a short timer before you can re-open them, so you can't just stand next to the same one and chain-click, but by the time you've done the rounds of nearby clams the ones you started on are ready again. There seem to be a lot of items to get. It was a good while before I started seeing duplicates. A lot of the presents are house items in any case, so multiples are welcome. Especially so since GU106 added stackability to most house items. As well as furniture I got a consumable Othmir illusion and several appearance weapons. It was addictive and fun. In the Test channel several people were saying exactly that, almost purring with satisfaction as the little bursts of dopamine stroked their pleasure centers. I notice no-one ever says developers are scoundrels for including this kind of content - it's ony when they lock it in a box and charge for a key that people begin to claim no-one wants it. Oceansfull also brings a traditional shiny collection, which takes place on land. I found a few purple shinies but they seemed relatively scarce compared to the norm in other festivals. I didn't really spend long looking - I'll save that for the few days I have when the festival is Live. All in all Oceansfull looks to be yet another excellent addition to the holiday calendar. It's quite astonishing that the small team left working on EQ2 is able to keep coming up with so much new stuff. This is a simple festival, yes, but it's fun and it fits with the lore, too. 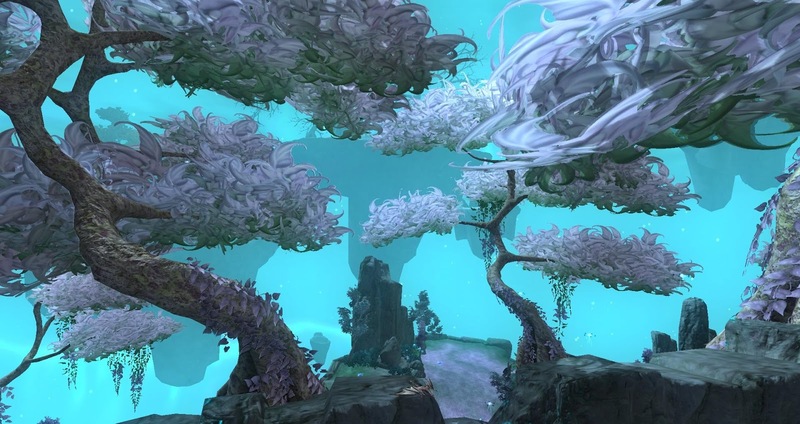 Oceansfull is available on all servers including Progression/TLE from the 8th to the 18th of June. It can be enjoyed by characters of any level at a variety of beaches from starting areas to end game. There are no quests to get - jump right in the water and start opening those clams. Just don't forget your diving gear! Comments are the lifeblood of blogging. I love getting them and I love making them. It's one of a couple of things saving blogging from being not much more than a high-tech way to keep a diary, turning the whole process into a strange kind of slow-burning conversation. (The other, in case you were wondering, is cross-posting). Given the importance of comments, it's a great pity blogging platforms often seem to go out of their way to make posting them as difficult as possible. There are some blogs where I never comment because of the hoops I'd need to jump through and others where I only comment on rare occasions because it's such a pain to navigate the required permissions. Granted, sometimes it's because I run NoScript in Firefox, but even if I switch to Chrome there are a few blogs that just defeat any attempt to communicate. All of which makes it particularly irritating when some faceless beaurocrat (hmmm... good character name...) decides to remove one of the few existing options that actually works. I'm an undemanding user when it comes to software. Quite demandingly undemanding, in fact. I generally like to use the most basic versions, usually on the default settings. Once I've familiarized myself with an app it's very rare indeed for me to want to adapt or upgrade it in any way. One of the great benefits of using Blogger over the years has been that Google mostly seems to have forgotten it exists. The downside, especially following the sudden and unexpected demise of Google Reader, is that it does create a sense of unease over Blogger's longer-term future. Other than that slight anxiety, no news is good news. Unfortunately it appears that someone at Google wandered past the Blogger office this month, brushed aside the cobwebs, pushed open the door and decided, in their own words, to do a bit of "spring cleaning". That's management-speak for taking away stuff we don't - in their opinion - need and replacing it with stuff that - in their opinion - we do. Most of it I'm not fussed about one way or the other. I'm surprised they're bothering to fiddle with Google+ integration, though. I thought everyone pretty much agreed G+ had been a complete washout and we were all just waiting for it to close down altogether. Then again, perhaps changing widgets specific to G+ into more generic HTML ones is preparation for that very day. As for the changes to localization, I never understood why my blog comes with a separate modifier for every national domain in the first place. Good riddance to that. The change that does annoy me is the removal of support for OpenID. The justification given is that it had "very low usage"and I admit I don't use it often myself...but "low" and "not often" don't equate to "non-existent" and "never". There are a couple of blogs where just about the only way I've been able to comment is by using OpenID and I would guess at least the occasional person uses it to comment here. All the changes, coming and going, are detailed in the Blogger Blog. Yes, Blogger has its own blog. How meta is that? I don't "follow" it. I barely ever look at it. It does, however, have a comment thread, where irony is raised to a new level. "Hey, this article is really helpful to me thanks for sharing your intelligence with us. As a new member of this community, I needed these pieces of information.Getting Involved in Conversations can also make my communication skill better, nice piece of advice there. thank you!" "Nice I am here for backlink exchange visit my blog and give some remarks with your blog url. I am coming to you within some days as this cooler". The thread is stuffed with such gems. It makes me wonder; if Google can't even be arsed to purge their own comment thread of stuff like this, do they actually read any of it? Ever? Anyway, if you rely to any degree on OpenID to comment on this or any other Blogger blog, consider yourself On Notice to find another means of making yourself heard. Also, in a revisionist move George Orwell would probably have appreciated, "all comments that previously used OpenID will be anonymized". You never said that, right? "New comments can be posted either from a Google account or labeled as “Anonymous” on blogs that allow it." Inventory Full does allow anonymous comments so at least there's that. There may come a time when I find myself thinking "You know what? I really have too many characters already. I think I'm going to give this free Level 100 thing a pass". That time is not now. 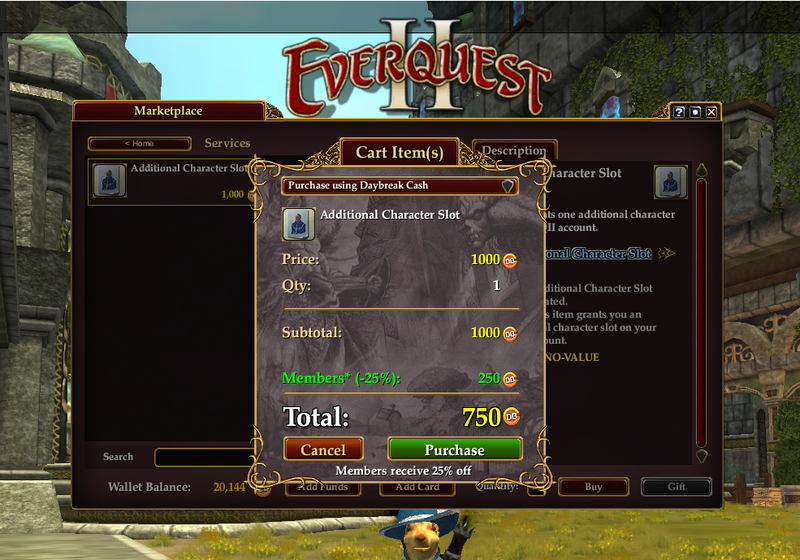 I knew, the moment I read about DBG's latest EQ2 offer, I wouldn't be able to resist. Even though I already have a clutch of bumped-up characters from previous giveaways I'll never have time to play. Oh, why even pretend there was ever any doubt? I just spent the best part of an hour creating two new Level 100 Heroic characters in EQ2 because of course I did. I had to buy a new character slot on my All Access account but that wasn't going to stop me. With the 25% holiday discount it was only 750DBC and I have over 20k saved up on that account. I was glad of the chance to spend some of it. 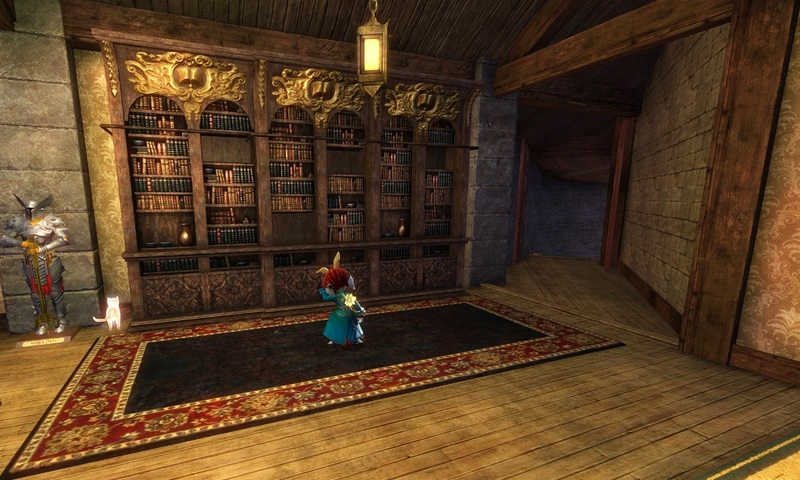 Running through the many options of races and classes I just about managed to avoid the rats and gnomes for once. I remembered how surprised I'd been to find myself enjoying playing a Fae for one of DBG's many Progression Server outings a while back. 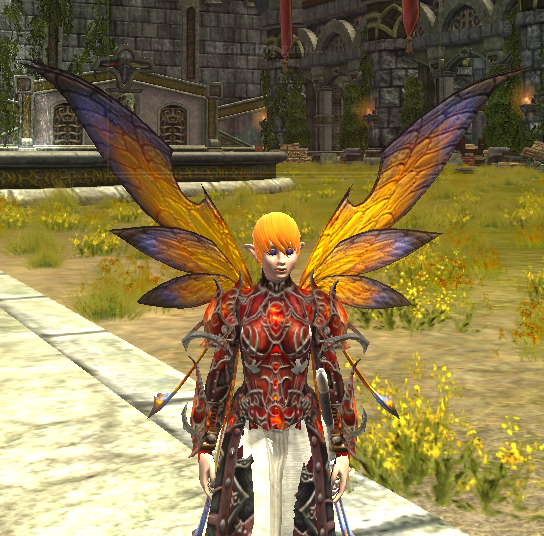 I don't have a winged wonder on Skyfire, my regular server. Well now I do. And she's a Wizard, a class I don't believe I have ever played. I ummed and aahed over trying a Ranger (did that back at launch - didn't end well) or a Defiler (my original EQ2 class, long since retired) but in the end it was the knowledge that I have (or will have, when I get around to doing the Tradeskill Signature line from the latest expansion on my Sage) a character on the account who can craft upgrades for spellcasters. And that's just on Skyfire - on this account. I don't want to think about all the characters on other accounts and/or other servers, some of whom got bumped up to 90 or 95 back when that was top end. Let alone the ones still trying to level up the hard way. That's just a month and a half of the stipend you get for All Access. Bargain! That'll be why I parked the Wizard as soon as I'd grabbed her free familiar and her mercenary so I could log in a second account and make a fresh, free Level 100 Dirge. A dirge is a scout. Which explains why I have never played one. I have, however, seen Dirges played. A lot. Mrs Bhagpuss, who has a history of playing scout/rogue classes stretching from early EverQuest to this minute, played both a Dirge and a Troubadour in EQ2 (also all the other scouts but those are the two I most remember duoing alongside). The Dirge seemed particularly powerful, I always thought. I have also used Dirge Mercenaries quite extensively with several characters, to very good effect. If there's a scout class I might be able to tolerate, I think Dirge could be the one. If I ever find time to play the one I just made I guess I'll find out. Before that can happen I have to log in the other four free to play accounts and make Heroic characters there, too. Because of course I do. I almost did it before writing this post but I gave myself a smart slap instead. 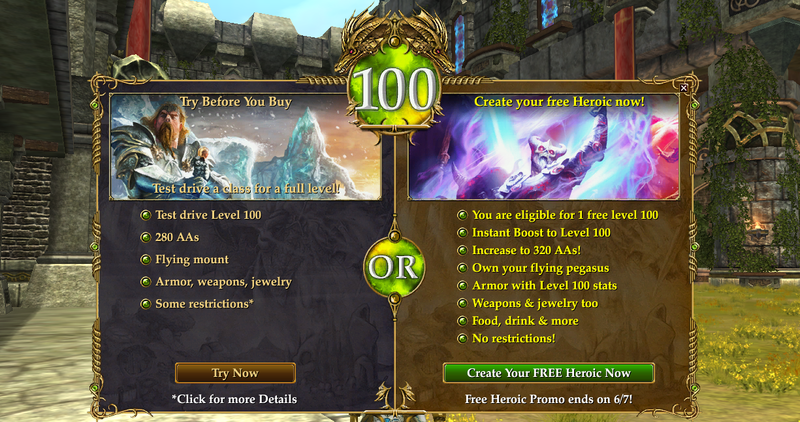 The Free Level 100 Offer runs until June 7th. There's no rush. Just so I get them all before I go away or the offer does. hit points than my new Level 100 cloth-armored Wizard. [EDIT] - Actually the zerker has double the HPs! Also all my augs were returned to bne refitted so maybe they also upgraded all the armor with the update? Heroic characters come fully equipped with gear, of course. They'd be more of a punishment than a prize if they didn't, after all. While I was on I took a quick look to see how good the gifted gear was and... it's too good. Seriously, I think some of it might be better than the gear my 110 Berserker is wearing. It's definitely better than the free Level 100 gear you get at the start of the Planes of Prophecy expansion because that's still available in the chest next to where you spawn in and I went and checked. Another feature of GU106 (which the free Heroic is promoting) is a revamp to the way EQ2's ever more arcane and abstract stats are displayed. The new, simplified version reveals the stark difference between the latest free gear and the last lot. It's all better. Power Creep in EQ2 seems to be turning into Power Jog, if not Power Sprint. Since the current offer requires you to make a brand new Heroic character not, as you might have assumed and as has been the case in the past, apply the boost to an existing one, there's no option to grab the new (No Trade) gear for an older character. I might have done that, looking at how good it is. The mysterious free house item. Unique is a word for it, I guess. As well as the free heroic and UI revamp, the latest game update also has content. The revamped Shard of Hate, which features in - and is a direct result of - the Tradeskill Signature line, is now open for business as a dungeon. It comes in Solo, Heroic and Raid flavors and when I finish this post I'm going to make a coffee and go take a look. I'm sure Innoruuk will be happy to see me. I did put him back on his Throne of Hate after all and he's not a god to forget his friends, is he? Character creation and posing for screenshots: the only time you ever see your characte from the front. There are also new Expert and Expert Event versions of the expansion dungeons, none of which I am ever likely to use but which I'm sure will be of great interest to someone. Then again, the update does add a new option - the Elixir of the Expert - a consumable under whose effects any player, however poorly prepared, will find "their stats increased to a level which will allow them to contribute effectively to their group". Last but certainly not least the update co-incides with the first wave of Summer Ethereals and there's a double XP event for the holiday weekend. Which is actually not a holiday where I am and I'm working Saturday and Sunday but never mind. I was looking through my back pages the other day, searching for anything I might already have said about Pirate 101, when I found something interesting. My first attempt, I think, to list all the upcoming MMORPGs and/or Expansions I was looking forward to playing in the near future. For a long time posts like that were ten a penny in this corner of the blogosphere. 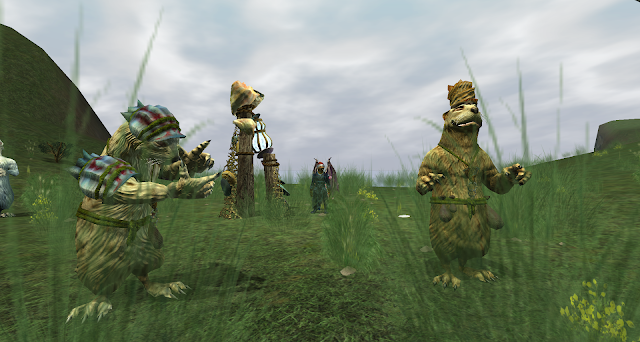 There seemed to be more MMOs in development than most of us were ever likely to have time to play. Which to grab, which to dodge? It's an interesting list in and of itself, if only because everything on there did, in fact, launch. I have other, later posts of this nature where that is very much not the case. In 2012, F2P was still bedding in. The era of Early Access, Kickstarter and pay-to-play Alpha lay ahead of us. By and large, we still expected our MMOs to come from mainstream developers or at least indies with funding already secured. If a game was announced we expected it to launch - probably a little late but certainly not never. Reading through my brief notes on what I was expecting back then, it's clear I never doubted that all these games would go Live. If I was posting something similar now - assuming I could even come up with nine titles I wanted to play - that certainly wouldn't be the case any more. Pirate 101 - " ...the KingsIsle style and try-before-you-buy model makes this a definite"
No, it doesn't. I played the Sneak Peak for about an hour and then waited six years to play the game proper. Turns out it was pretty good after all. It's still running successfully and likely to carry on doing so for a good while longer. Marvel Heroes - "I really would like a super-hero MMO in my rotation... maybe this is the one." It wasn't. After taking the trouble to sign up for beta and getting in I played Marvel heroes maybe four or five times. I didn't like it much. The character models were too small to see properly, the gameplay was repetitive and it didn't feel anything like a super-hero game. MH trucked along very successfully for several years before crashing and burning in spectacular style for reasons that are still somewhat unexplained. An odd and unexpected ending. When it went I sort of wished I'd given it a better run but in the end it probably just wasn't my kind of thing. City of Steam - "Absolutely love this game... I'll be playing and writing about it." I did love it. I still do. I played and wrote about it plenty but still not enough. One of my favorite MMORPGs and definintely one that failed to live up to its full potential. The original vision for the game was, as I wrote, "a real labor of love" but financial issues led to a very poor publishing deal from which the game never fully recovered. Now, sadly, sunset, although the possibility of some kind of revival or revisiting of the IP remains a tantalizing possibility. 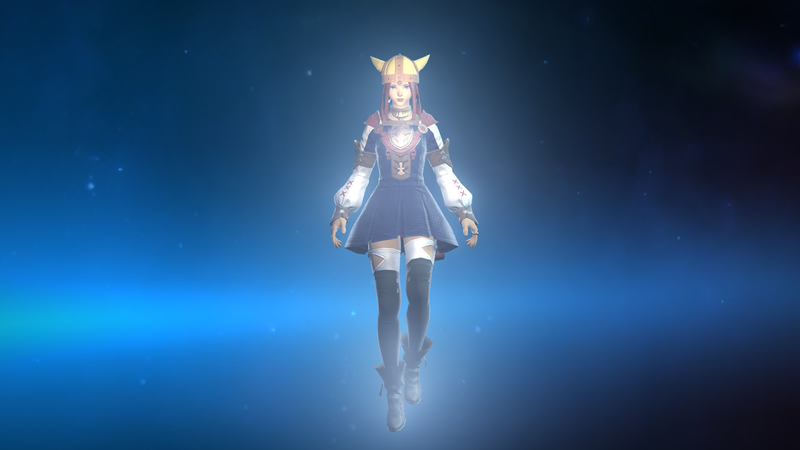 FFXIV: A Realm Reborn - "I'll probably at least try it"
I did. For a month. When the came time to subscribe, I declined. I had - still have - very mixed feelings about FFXIV. I like the world, the races, the classes, the look and feel. I even like the combat. Most of the gameplay, however, I despise. I find it coercive, restrictive and above all paternalistic. Pottering around at low levels is wonderful but any serious attempt at character progression leads immediately to boredom, swiftly followed by anger. FFXIV is by far the closest anyone's come to remaking World of Warcraft but in doing so it seems to me to have doubled down on all the worst aspects of that game. Despite - or more likely because of - that it's been a major success story for the genre, coming at a time when one was badly needed. Rift: Storm Legion: "I will get this but again mid-November is probably too soon". Yes I did and yes it was but Trion offered a very enticing 12 month sub with pre-purchase and I fell for it. Mrs Bhagpuss and I spent a desultory week there before returning to GW2. I hated Storm Legion itself; Mrs Bhagpuss barely even set foot in it. A few months later, Trion unexpectedly took Rift F2P, thereby overturning a number of Scott Hartsman's earlier statements and rendering most of our twelve-month sub worthless. We got a "refund" in Rift Funny Money and Mrs Bhagpuss came back long enough to spend it all on decorating Dimensions, after which we left for good. Since then Rift has limped along, finally resorting this year to a rushed and misfiring attempt to farm a crop of nostalgia that seems barely to have had time to ripen. Storm Legion remains generally unpopular as far as I can tell while Trion itself has made a habit of annoying its own customers. I was merely an early adopter. I suspect Trove, the weird cartoon blockbuilding game, pays most of the bills these days. 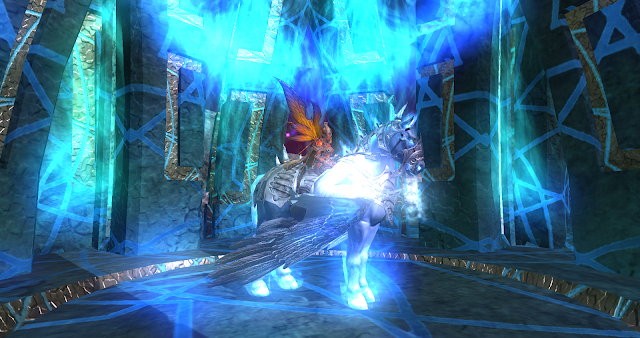 EQ2: Chains of Eternity - "...it's unthinkable that we won't eventually get this". What do you mean, "we", Kemo Sabe? 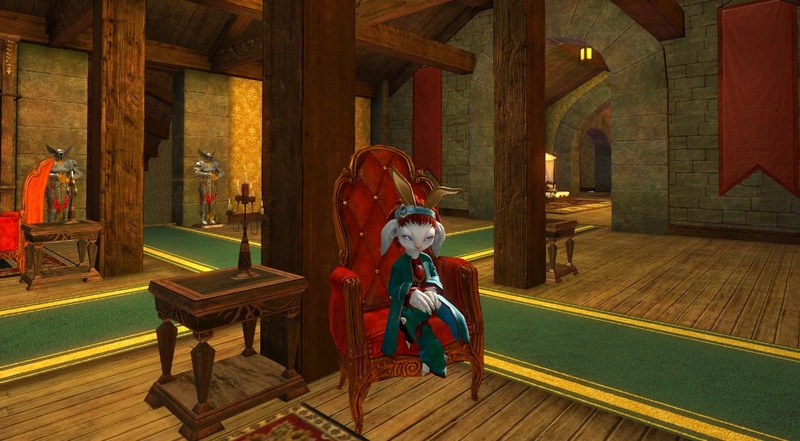 I don't believe Mrs Bhagpuss has set foot in EQ2 since GW2 launched. I do now own Chains of Eternity, mainly because it came free with a later expansion. I did eventually play all the way through the Signature quest line. It was okay but the more recent expansions have been better. 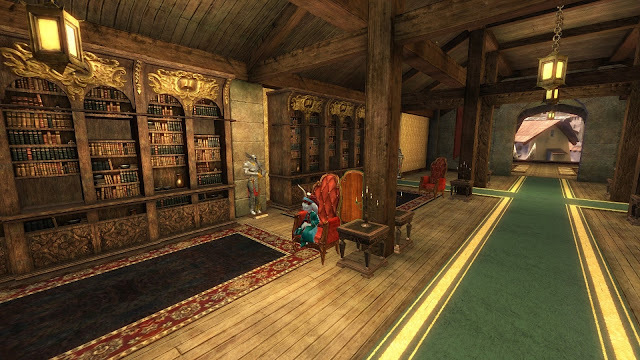 EQ2, like Rift, limps on, surviving but having seen better days. After the sale to...erm...I'll get back to you on that one... and the recent layoffs, I'm mostly just glad to see the servers are still up. 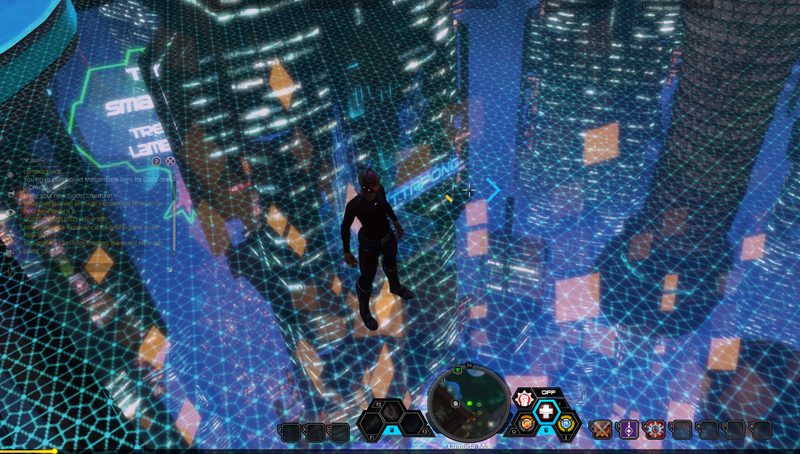 Otherland: "The IP has superb potential... going to give it a try. It's F2P so why wouldn't I?" Why indeed? Perhaps because it was a buggy, unfinished mess that didn't so much fulfil that superb potential as trample it into the mud and jump up and down on it. And yet...I keep going back. I haven't not had a few good sessions there. I did get some blog posts out of it. The potential, trampled underfoot as it may be, is still there, somewhere. Neverwinter: "I'll be there day one when it goes Live, that's for sure." I was but I didn't hang around long. Looking back at this list, it's my enthusiasm for Neverwinter that surprises me the most. I don't remember being so fired up for it. I think I must have imagined it as an updated version of NWN2 because I was clearly planning on writing scenarios for it. I never did. I never even opened the scenario tools. Neverwinter doesn't seem to get a huge amount of press attention any more but as far as I know it remains a successful, well-populated MMORPG. It's certainly been well-reviewed and favorably written up by a number of bloggers I follow. I've dipped in a few times and I might take another look one day. No hurry. I imagine it'll be around for a good while longer. Planetside 2 : "I've been in beta for a while but I haven't played much...I can use my existing SOE account so it's going to happen". No it's not. I played maybe three or four short sessions in beta. I had next to no idea what I was doing and I didn't enjoy it much. I might have logged in once or twice since PS2 went Live but if so it would only have been to get a blog out of it. As for how it's doing, messages seem to be mixed. It certainly has a following and I've read a few blogs and comments that suggest it can be good fun. Whether it makes any money for DBG, who knows? It's still there, though, which counts for something. So there we have it. Nine hotly-anticipated slices of video game entertainment and I ended up enjoying precisely none of them with the intensity or investment I predicted. As I said, at least they all did materialize, most of them approximately when they were expected, but all of them either turned out to be somewhat underwhelming or just not for me. Of the nine, the one I'd most like to play right now and the one I'd say I got the most pleasure from over the longest time was City of Steam. Sod's law that's one of the two that's already gone. Over the last few years I've managed to find reasonably cheap copies of most of the White Wolf gamebooks for the EverQuest Roleplaying Game. I think the only ones I don't have now are Al'Kabor's Arcana, Plane of Hate, Temple of Solusek Ro and Castle Mistmoore; of those four, the only one I really want is the last one. It's just as well I decided to collect them when I did because as the supply dwindles the price increases. I don't think I'd ever have started buying them in the first place if the average cost then had been north of $50 per book, with some titles breaching the three figure barrier, like they are now. As it is, at least I can rest easy, knowing that if (when) the final, official server goes dark, I'll be able to GM a tabletop EverQuest campaign with my pals in the old folks home. Or I guess I could just play P2002. Whatever. When the affordable supply of White Wolf titles dried up, I did briefly consider scooping up the Prima Game Guides instead. There are still oodles of those up for grabs at exceedingly reasonable prices, many of them for no more than the cost of postage. Pretty sure I knew a "Nugget" and a "Deena". I imagine everyone knew a "Lenore"
That's not surprising. In its day, EQ was a very successful game, with millions of players. Back then, I never felt the need (or desire) to buy a professionally produced hard copy of exactly the same kind of information I could get for free from Allakhazam or Caster's Realm. 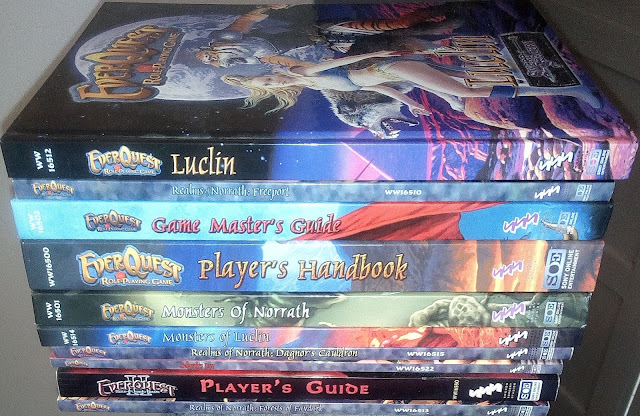 Clearly many did, though, because Prima pumped out guide after guide for years, eventually moving on to produce guides for EQ2 as well. Out of curiosity I did put one of the Prima guides on my Christmas wishlist, just to see what they were like. I could have picked any of them but I plumped for the Ruins of Kunark. It duly arrived on Santa's sleigh and I've given it a good thumbing in idle moments since then. It came well-thumbed already. "Pre-loved", as the marketeers like to say. Someone had obviously gotten a very great deal more use out of it than I ever will. I say that with confidence, not because it was battered or worn - on the contrary it was in excellent condition - but because it has been annotated throughout (very neatly,) in pencil. Many of the spell lists have ticks or dots against them. The previous owner seems to have been something of an altaholic, with a strong preference for casters and priests. Most of the notes are in the sections devoted to the Magician, Shaman, Wizard, Druid, and Enchanter classes. The Necromancer is a notable omission so I surmise the previous owner leaned towards the light. As well as the pencil additions, which included a few extra notes about the Shadows of Luclin expansion (although nothing relating to Scars of Velious, which came before it), I found a few slips of paper tucked between the pages. One was a set of instructions printed from some unnamed website or forum detailing how to insert pauses in macros. 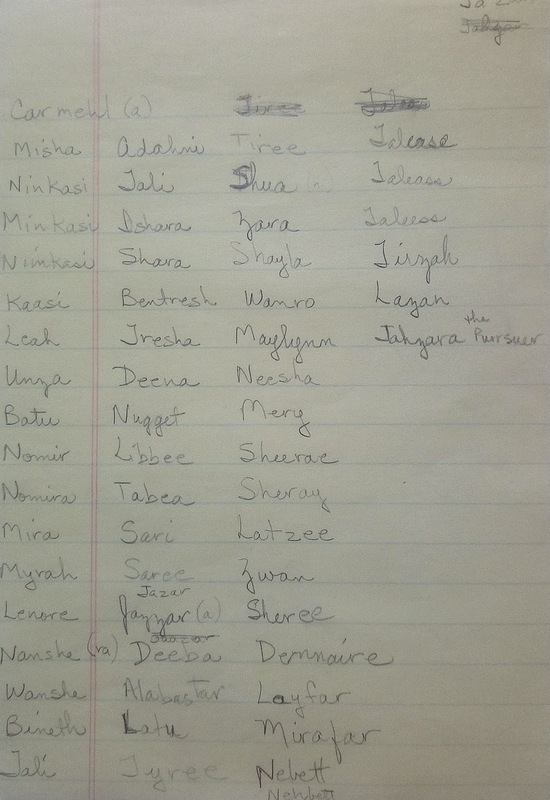 Another, more poignantly, appears to be a list of the names of in-game friends or guild members - or possibly just some jotted ideas of names for characters. 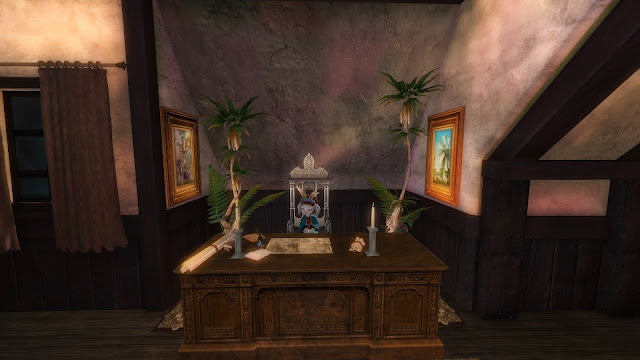 "For the first few months after EverQuest's release, we felt that a policy of non-interference in many of these matters was warranted. However, we continued to lose good players. This was not due to any deficiency or dissatisfaction in the game, but due to dissatisfaction with the treatment that they received from their fellow players, and the perceived inability of our Customer Service department to intervene." A few pages later, under the heading of PvP Servers, we read that as far as Playing Nice is concerned "...we expect that the people on those servers will apply PvP combat in all situations where it is called for as a resolution to the problem. As such, the EverQuest Customer Service Staff will decline to intervene in cases where a PvP alternative exists..."
That certainly puts a different perspective on why Verant (later SOE) continued to place such an emphasis on PvP, despite the ever-dwindling interest among players, not to mention why Smed himself became such a fan of EVE Online. Flicking through the pages, some arresting assertions leap out. Did you know that even by the time of the game's first expansion there were already 216 different types of player-made arrows? Or 63 different crafted bows? It also seems somewhat disengenous for an official guide to blandly confirm what all too many players already suspected - "Level 1 spells - Many casters find these spells worthless". True North, anyone? Yes, I could have picked a less busy background. And done something about the glare. Reading the Prima Guide is a glimpse into a lost world. The sheer complexity of the game, even at this early stage of its as-then unimaginably lengthy life, is deeply intimidating. It's no wonder players felt they needed a helping hand. Not that Prima was having any truck with handholding. 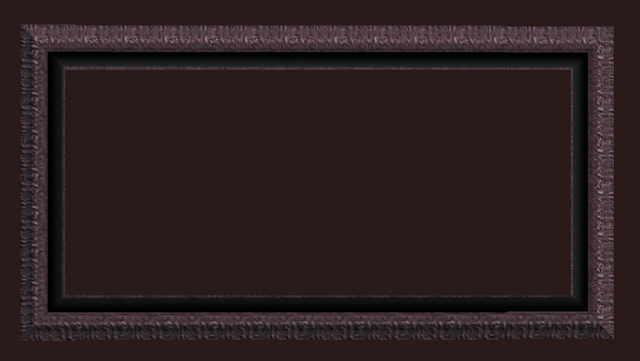 Item after item hammers home the unforgiving nature of the game and the world in which it's set. The section on "Tactics" for Bards, for example, is succinct on playing solo: "Don't do it" . Bold type theirs, not mine. The entry on experience is enough to bring on flashbacks : "After level 5, dying costs you experience. This XP loss gets bigger as you level up. Eventually you'll be losing about half a bubble of XP per death. In addition to that, it will look like you've lost less during a hell level (30, 35 etc.) but it actually hurts more." It's that casual "etc." that really twists the knife. 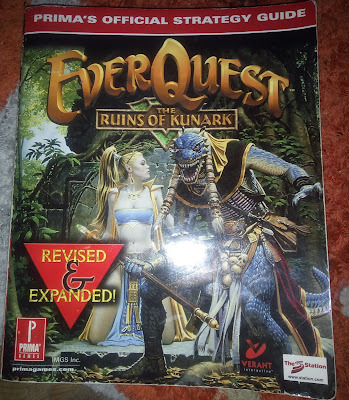 All in all, the Kunark Prima Guide was a worthwhile purchase (or would have been if I'd paid for it). It reminded me of a lot of things I'd forgotten and I may even have learned a few new ones. I'm not sure I'll be buying any more because I get the feeling there will be a great deal of repetition and a general sense of diminishing returns. On the other hand, at a penny a time plus postage it's not like I have a great deal to lose. I'm rather glad, though, that I never bought one of these guides back in the day. Although whoever compiled the wealth of information it contains made a considerable effort to avoid pulling the curtain back too far, it still reveals more than I would have wanted to know when I was playing regularly. 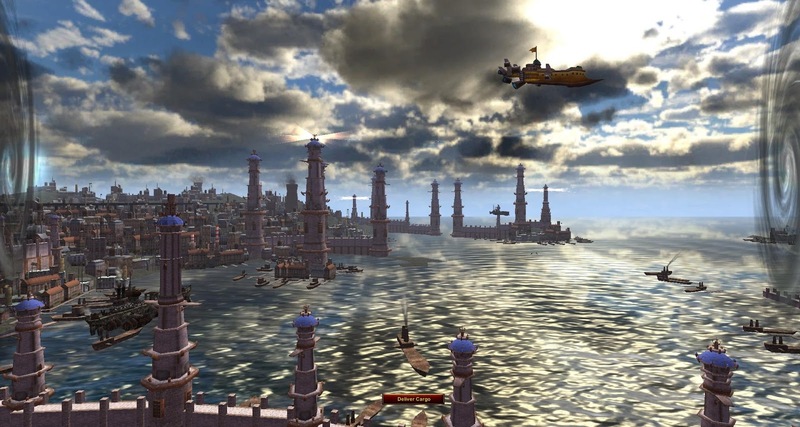 One of EQ's - and the MMORPG genre's - biggest strengths for me was always its impenetrability. I loved not knowing exactly how things worked, having to try and deduce first principles by trial and error, preferably without getting myself killed in the process. I particularly loved the endless urban myths that surrounded the game's most arcane aspects - all those myriad theories on how to spawn the Ancient Cyclops or Quillmane, every one supported by anecdotal evidence from "a guildie" or "my brother". As with the White Wolf books, it's very comforting to know that at least some sort of solid evidence of the fun we had will survive. Video games are slowly beginning to achieve historical and aesthetic recognition; an archival afterlife may yet exist for some. All the same, in my dotage I can't see myself toddling down to the gallery on my walker every time I feel in need of an EQ fix. These books are the fragments I have shored against my ruin, as I suspect I may have said before. I might build the wall a little higher, yet. It's strange how the mind plays tricks. 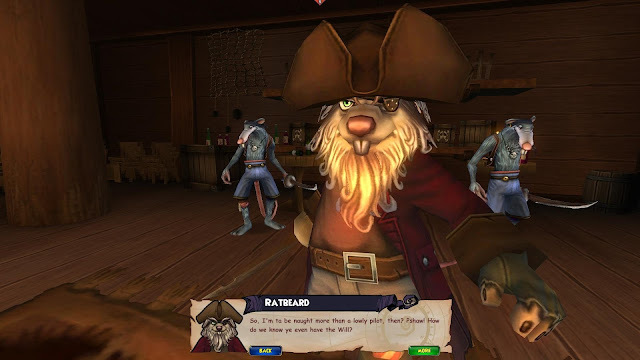 I was sure I'd played Pirate 101 for a little while at launch, given it maybe a couple of sessions to make its mark, decided I didn't much like it and never played it again. Some of that is true. A comment by Cutie DarkFae on my most recent Wizard 101 post made me wonder whether I oughtn't to take another look. After all, I'd been banging on about how much W101 had changed in the long years since I last played it. MMORPGs tend to do that. 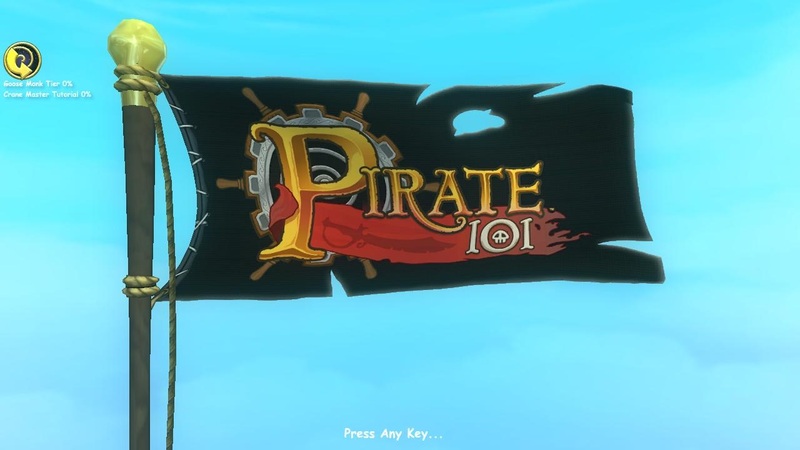 How much more might Pirate 101 have changed, given that it was barely formed when I made my judgment? Maybe I'd written it off too quickly. I downloaded P101 and logged in. KingsIsle certainly make it easy. As with W101 the download took a matter of moments. My login for Wizards worked for Pirates too. "Adrift" is right. Six years adrift! I thought I remembered finishing the tutorial and getting to somewhere around Level 5 before I stopped the first time so I was a bit taken aback to see my Pirate was only Level 2. Level 2? Surely that means I'd barely started? In most MMOs made since about 2003 you hit second level pretty much the moment you step out of character creation. Sometimes before. Fortunately, because I have a blog I can check these things. It's one of the main reasons I do have a blog, in fact. Looking down the insanely long tail of Tags at the foot of the blog I eventually found I'd posted about Pirate 101 precisely twice. The first time was to mention the game was due to launch on October 15, 2012 and that I was looking forward to playing it. (Leaving aside the P101 aspect, the linked post there is very interesting for all kinds of reasons. I may well revisit it sometime soon for a follow-up - but let's not get sidetracked just yet). 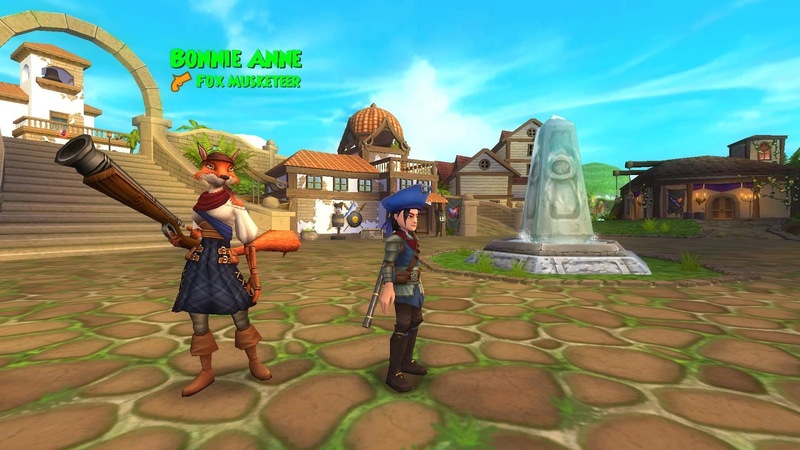 The second and last time I wrote about Pirate 101 was just two days later. I said I'd played the "Sneak Peak" and finished the Tutorial. Apparently I logged out when I reached Skull Island. It must have taken me all of half an hour, character creation included. Despite a generally positive tone to the post, which I finished with a cheery, piratical "Looking forward to exploring the Sky Seas with all o' ye! ", as far as I can tell I never logged in again. Any memories I had of playing at launch are false. I saw the Tutorial zone in a Sneak Peak two weeks before the game went Live and that was that. No, really it was worse than that. Based on my experience today, what I saw back then wasn't even the full Tutorial. More like the pre-Tutorial. 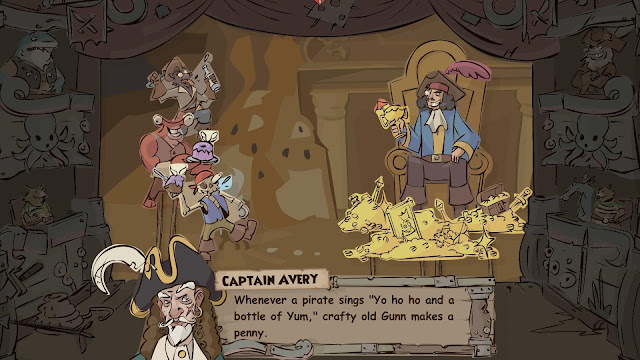 This afternoon I played for almost two hours, taking my Pirate to the dizzy heights of Level 5, and as far as I can tell I'm still in the Tutorial. A still from a very strange "animated" cut scene. Not sure about this one at all. I've written about Tutorials before and no doubt will again. The short version is I'm against them. Nevertheless, I do recognize that they are a necessary evil, the reasons for that being most convincingly and revealingly explained in this Journal entry from We Happy Few. (Incidentally, I recommend the journals and dev blogs from WHF to anyone interested in how games come to be - and especially on how they come to be something other than what they were supposed to be). Pirate 101, like W101 before it, has the best kind of Tutorial. It's the game. You don't go to a Special Place to do Special Things. You start in the same world you're going to play in later, you talk to the same NPCs, do the same quests, fight the same fights... The only difference is that a voiceover explains what's happening and the UI points out things you need to notice if it looks like you've missed them. When I played P101 the first time I didn't much like the combat. I didn't say anything about it in the piece I wrote, except to criticize the very concept of ship-to-ship combat, but I do remember quite clearly finding it slow, awkward and annoying. The movement and action screen for fights is very easy to understand. Must be. I understood it. Either that's another false memory or six years of development have made for some very significant improvements. This time round I found combat slick, entertaining and well-designed. Like KingsIsle's other game, this one is turn-based. Compared to the average MMO I think it would be more than fair to describe the combat style here as "stately". It's a lot faster than Wizard 101, at least, for which I am very grateful. Like every MMO, combat begins when you get within aggro range of a mob. When that happens the game grabs the player, grab some mobs, positions them in a face-off , decides who has initiative and Round One begins. Every fight happens in a weird kind of invisible dome. You can see other mobs and players walking by but mobs won't ever join in once combat begins. The only way you can get "adds" is if a passing player decides to help out, which in W101 they can do at any time, whether you like it or not. If that happens the game can add extra mobs to even the odds, so getting "help" can be a mixed blessing. I'm assuming Pirate 101 works that way too but I can't be sure because in two hours I never saw another player. Whether that's because the entry-level game is dead, or because I happened to have a legacy character on a shard that's become moribund over time, or whether in fact I spent the entire session in a private tutorial instance without knowing it, I really can't say. Before the main combat/action screen comes this very elegant top-down schematic view. I don't care much either, not at this stage, because I was too busy having fun. Also trying to catch my breath. 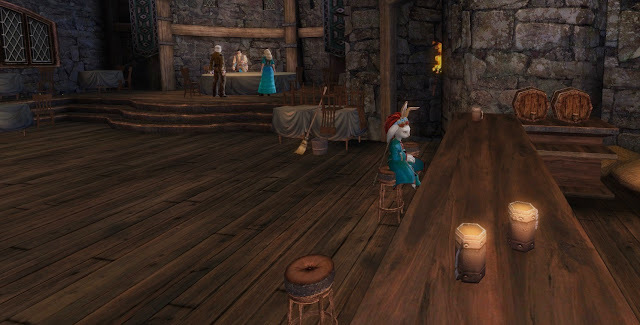 It's a while since I played an MMORPG with such a relentless pace. It's not fast yet it's fast. Every time I thought I'd finished a quest it turned out to be just the lead-in to another. There's a strong narrative spine that may, for all I know, extend through the whole game but there are also many side quests, most of them either interesting or amusing. At this point I decided I needed a break. The game clearly had no intention of giving me a clean out so I just camped where I was and came to write this post. It's too early to make any definitive statements - I'm still in the furshlugginer tutorial, for cripe's sake! 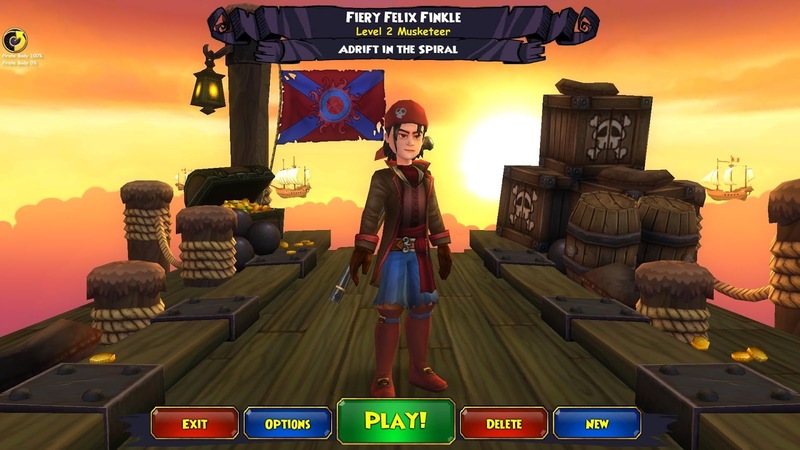 - but Cutie DarkFae may have a case: Pirate 101 may indeed be a better game than Wizard 101. The climax to this Boss fight was so dramatic I have a strong suspicion it was fixed. I was dead, the tough NPC who'd come to help was dead, all my crew except the First Mate were dead. She had about 2% health left. One hit and she'd have been dead too and we'd have lost. What did Sharkface do? Chose to move three squares instead of hitting her. It's certainly better-looking, as well as being faster and more dynamic. In terms of looks, I think W101 stands up well for its age but the screenshots from KingsIsle's sophomore effort show how much more detail there is in the characters. The backdrops, while not all that different, are probably a tad richer too. There's nothing all that surprising about Pirate 101. It's very much "un game de KingsIsle", an improved iteration of the established formula. The most puzzling thing is why I've never played it since the official launch and why I was so sure I'd given it a fair try and didn't like it, when the evidence proves I hadn't and I did. The one serious thing wrong with both W101 and P101 is that you can only play a boring human. I'm very glad to have been nudged into going back for another look. Just goes to show you sometimes do get a second chance to make a first impression. Time permitting, I intend at least to play through all the free content. It might take me a while but there's no hurry. I've waited six years already. As far as I know, "Maintenance Mode" for MMORPGs is a relatively recent innovation. 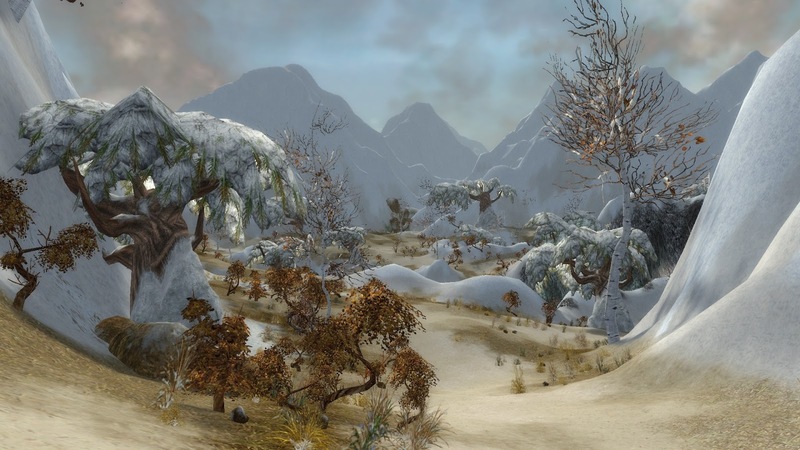 While any number of MMOs may have slipped into de facto maintenance-through-neglect over the years, the first time I heard of one being officially mothballed was when ANet decided to "automate" the original Guild Wars in 2013, following the successful launch of the sequel, GW2. Square Enix followed suit, pulling the plug on further development for FFXI a couple of years later. 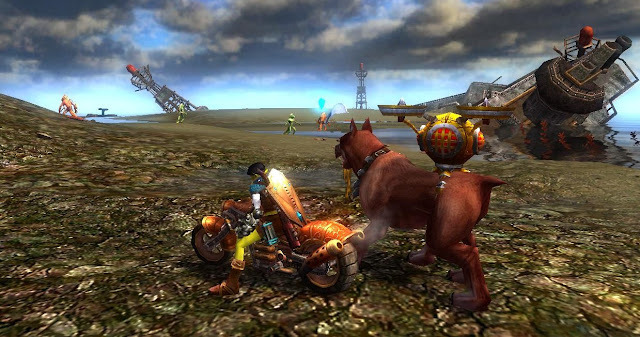 It was a decision driven primarily by the increasing difficulty of keeping the game running on ancient consoles, although, like ANet, Square no doubt also hoped to avoid splitting the audience after the eventual, successful resurrection of FFXIV. That turned out to be a famously ironic decision. There was no maintenance mode for the PS2 or XBox 360 players. Their versions simply stopped. For the PC players, however, things carried on almost as normal. Three years after development supposedly ceased, FFXI still receives more updates in "Maintenance" than many MMOs get in their prime. It's a telling example of how "maintenance" can mean very different things to different developers. 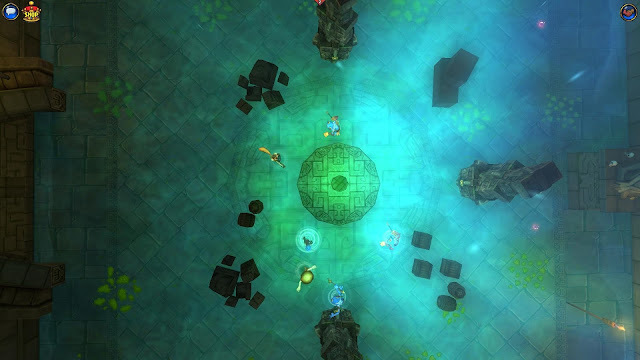 SmokyMonkeyS began by abandoning their intent to create a fully-blown MMORPG with Ninelives before going on to give up on the single-player version too. The game went into what they called "temporary suspension" but it remains up and running and it's even received a couple of significant updates since development came to a halt. Funcom's The Secret World, on the other hand, seems to have dropped off the radar entirely since it was replaced by Secret World Legends. ANet have left Guild Wars assiduously alone since they announced the end of active development. Their version of maintenance included the full automation of repeatable events like holidays, aniversaries and special bonus weekends. The idea was that the game would remain up indefinitely for those who still wanted to play but it wouldn't require - or receive - any input or resources to keep it running. It was something of a surprise, then, to read last week that the game was getting a graphics overhaul. It's certainly true that many MMOs start to show their age in the visuals long before the gameplay dates. As the genre ages some developers have been puzzled, even dismayed, to find a significant number of their customers sticking with old favorites for far longer than expected, which has led a number of of them to attempt to give their fading stars a facelift - with varying degrees of success. That makes sense if the old game is still the one bringing in most of the revenue. Moreover, if a developer is entertaining even the smallest hope, however misguided, of attracting new players, it's true that 2005 graphics don't make for much of a shop window. Guild Wars doesn't seem to be actively promoted any more, although you can still buy it from the website, so why bother tuning the graphics? Turns out it was one of those "passion projects" we often hear about, most of which turn out to be something else entirely. Not this time. This one was genuine. According to Eurogamer, a power surge at ANet's European data center led indirectly to a couple of developers using their off-hours to tweak the old Guild Wars engine to add a whole slew of new options inluding "windowed fullscreen support, a new 8X MSAA anti-aliasing option, 16x Anisotropic filtering support for the existing "use best texture filtering" option". The new version looks sharper, something that was even more apparent in-game. They also fiddled with the draw distance and the LODs and added a toggle to maximize both. In my experience, changes to draw distance can be one of the most revelatory changes a developer can make to a game. 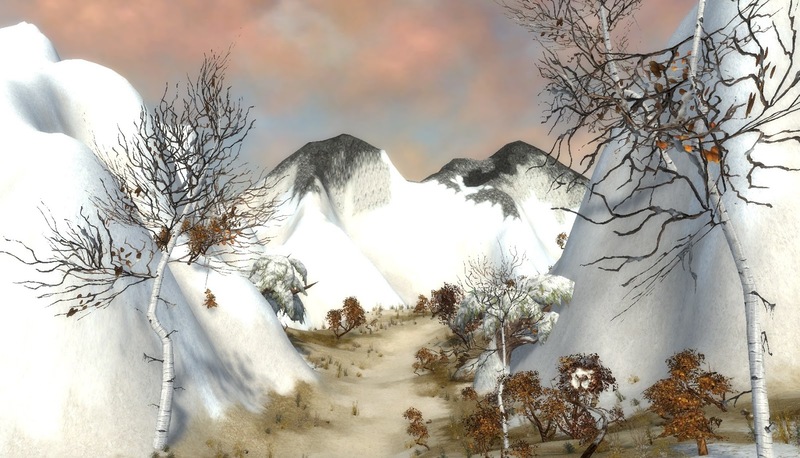 When SOE pushed EverQuest's draw distance out to the horizon it changed the game overnight. Huge areas that had been shorouded in thick fog for the years I'd been playing suddenly came into view. It was awesome. The changes to Guild Wars aren't on that scale of magnitude for the simple reason that Guild Wars zones tend to be designed rather cleverly to give an illusion of space while actually being quite constricted. Unlike EQ, where the plains of West Karana stretch into the middle distance, regions like Deldrimor Font or Borlis Pass are full of twists and turns that restrict the line of sight. Even the mountains that form the backdrop are scarcely a jog-trot away. If the differences between the first two pairs were subtle, here they are unmistakeable. Or perhaps I just went to the wrong zones to test the changes. Maybe I should have tried the snowfields of the Far Shiverpeaks or the savannah of Elona. Instead I went to revisit Yaks Bend, one of my favorite spots in Tyria and also somewhere I can remember very clearly. I figured it might give me a better chance of appreciating the changes. The difference is quite subtle but noticeable and certainly worthwhile. I think it's fairly easy to spot the Before and After in the screenshots. The new version removes a deal of the "fog" from the zone walls, bringing the mountains into sharper relief. It also reveals details like smoke from the fires and the occasional previously unseen peak. In one shot there's even a mysterious light in the sky that might be either a graphical glitch or an astronomical object. Not only do the hills and far trees come into focus but smoke can be seen where there was none before. There's nothing here that's going to pull in new customers but for anyone still playing or returning for a nostalgic visit it should come as a very welcome sign that someone's still paying attention. Stephen Clarke-Willson, one of the developers who did the voluntary work to make these changes happen, along with less-visible but equally welcome fixes for the tools used to report bots and RMT trades, is quoted as saying he'd "like this game to run for many years". Let's hope he gets his wish. 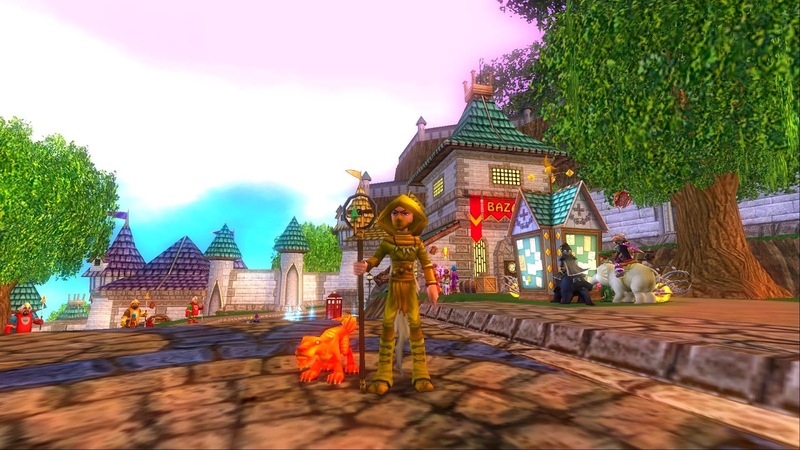 Wizard 101 continues to be the MMO I play when I'm not playing Guild Wars 2. This is not a sustainable situation. Currently I find myself with two gaming subscriptions (W101 and Daybreak All Access), which is at least one more subscription than I would like, given there are literally dozens of good, enjoyable MMOs I could play for nothing - including all the ones I'm currently paying for. I also - somehow - still have an Amazon Prime subscription, which I seem mainly to be using to watch episodes of old tv shows that I already own on DVD, because watching them on a tablet is more convenient than using the portable DVD player I bought specifically to watch them on. This is the beginning of a potentially catastrophic behavioral change that could see me taking out subscriptions to all kinds of things - Netflix, Spotify, Audible... It needs to be nipped in the bud right now. One thing I categorically do not want to find myself doing is resubscribing to W101 when I get back from holiday in mid-June. The problem is that Wizard 101 is really very good indeed. It was always a much deeper and more involving MMORPG than its reputation as a "kids' game" suggested but after a decade of additions it's turned into a real hidden gem. It's also hard. Too hard for me. This is The Maestro. Might be a fox. Maybe a jackal. Definitely Roger Delgado. Just look at the moustache. This weekend I got as far as the third of the five B.O.X.E.S. The questline took me to MooShu, the zone based on Feudal Japan, if Feudal Japan had been populated by samurai cows and ninja pigs. 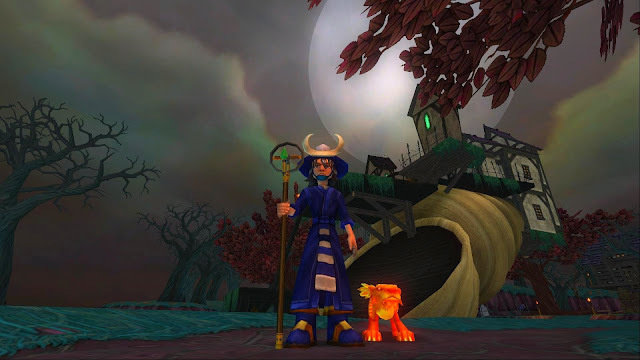 Zones in W101 don't generally have precise level requirements but MooShu is broadly aimed at the mid-to-high 30s. My wizard is level 41. He finished MooShu (did the main questline and defeated the zone boss) back on the original run so in theory he should be in good shape to handle a quest tuned for the zone. Should be but isn't. A lot changes in nine years. His gear wasn't great even then, being a jumble of whatever he happened to find while questing, but it looks severely underpowered now. The jewellery has (empty) sockets which I don't think were there last time I looked and nothing he's wearing has a required level higher than the mid-30s. Added to that he doesn't seem to have spent a Training Point since about Level 10. That was probably intentional. I remember dire warnings about wasting Training Points and waiting until you were max level (50 at the time) before using them. Indeed, that still seems to be the advice. 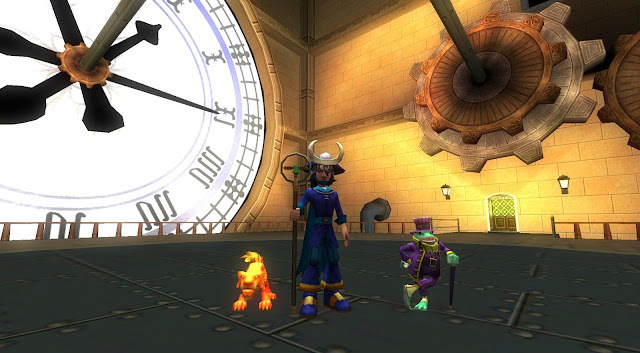 It's Thing #1 on Swordroll's list of Ten Things You Wish You Knew Before Starting Wizard 101. Lastly, and probably most importantly, I neither have the right cards nor the knowledge and understanding to make best use of the ones I do have. I'm sure that to people who routinely play card-matching games like Hearthstone, let alone MTG, W101's combat system must seem infantile but it flummoxes me. Victory pose after the defeat of the Boss of the Second B.O.X. That bloody frog did nothing! I don't really do card games. Legends of Norrath was always a mystery to me. I struggled through the tutorial when LoN first appeared but by the end I had little more idea what I was doing than when I started. What's more, I certainly didn't have the patience to keep trying in the hope the fog might lift. Also, back then I duoed with Mrs Bhagpuss whenever either of us ran into something too tough to solo and that made a huge difference. 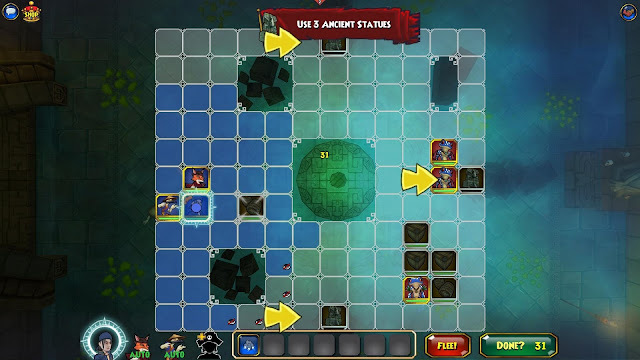 W101 is one of the MMOs that can be soloed but which is easier when you group. (And even as I type I realize that's a very dubious statement, which I may come back to in a later post). Yeah, you do that, shortie. About time you learned to do something. Other than pose, that is. The upshot of all this is that a combination of sub-par gear and spells plus a very low skill set is just not cutting it any more. I ran up against a brick wall half-way through The Professor's third quest, when I found myself facing Aunt Eunice, a Level 7 Boss with over 3k HPs, backed up by her Level 7 Elite Rotten Scallywag lackey. I took her on and lost. Very badly. I fiddled with my deck and demanded a rematch. I lost again. Not quite as badly but badly enough to be embarassing. Third time lucky? No. Had enough humiliation for one evening, thank you, Aunt Eunice. Instead, I did the sensible thing. I threw money at the problem. Not real money, although I have a suspicion W101 does have a Pay To Win element via the Crown Store, where you can buy gear and hire Henchmen. No, I went to The Bazaar in Olde Town, where players sell their unwanted loot to each other for in-game Gold. There was definitely no Bazaar last time I played but if you've seen one bazaar you've seen them all. Fortunately, even though the misleading tag for items that can't be sold via the Bazaar is "No Auction", Kingsisle have gone for the straight "put it up for sale at a fixed price" method. I vastly prefer that to any form of bidding. It's simple and you don't have to wait. I replaced my Hat, Robe and Shoes for the small cost of about ten percent of my net worth. That mount is looking further away than ever. The result pushed my hit points above 2000, slightly increased my destructive power and left me looking like a banana again. What is it with this game and yellow? Is it because I'm playing a Myth wizard? Is all Myth gear yellow? I'm going to end up permanently in hock to the seamstress at this rate, I can see that coming. With the thirty-minute timer on my instance fast expiring I didn't have time to research upgrades for my jewellery or work out where to buy better spells. I went back for another round and this time things went better. I got the Elite down and Aunt Eunice took a few good thumps but the end result was the same. 3-0 to the Aunt. At that point I decided to call it a night. There's a lot more work to be done. I need to research the jewellery slots and read up on those little icons so I can work out just what it is my cards do. There's a good chance I also need to get a couple more levels. More levels are always goos and if nothing else it'd give me a chance to practice tactics and earn some more Gold for my next trip to the Bazaar. What's worrying me isn't that I won't be able to improve in all the ways I need to progress. It's that the whole thing is starting to look like a much more serious project than I anticipated when I re-subbed for a month on a whim. The 5 B.O.X.E.S. event itself is only going to be around for another week or two. I'm not going to finish it no matter what because parts four and five require you to be Level 60 and Level 80 respectively and if I did nothing else for the next fortnight I'd not get that far. This has gone way beyond that event, though. I'm in grave danger of wanting to carry on playing for the sheer fun of it. And that would be very welcome if it wasn't for the whole subscription thing. I'm going to have to think carefully about this. I'm quite glad of the enforced holiday break, coming right when I'd need to pay the next month's sub. Hmmm... I thought I was done with this kind of thing five years ago, when F2P took off.